We, National Steel Processor, established in 2010, are a well-known Manufacturing and Exporting of a broad gamut of Coated Sheet & Roofing Accessories. Our product range includes Roofing Accessories, Galvalume Sheet, Corrugated Sheets, Cold Rolled Sheets, Hot Rolled Sheets and many more. We are a firm that has earned a favorable reputation in the market and sculpted a reputed name in this domain by adopting the highest business standards. We seek to be the global benchmark for value creation and revolutionary business practices. We are able to produce a large product line with the aid of our state-of-the-art infrastructure. Our well-equipped manufacturing unit is fully incorporated with various kinds of advanced processing machines. Apart from this, our offered products are well-checked on various parameters of quality, like durability, finish and dimensional accuracy by our well-qualified and experienced quality controllers to comply with international quality standards. Apart from this, our logistics and supply chain system is actively involved in designing, planning, execution, control and monitoring of supply chain activities with the objective of creating net value, building a competitive infrastructure, leveraging worldwide logistics, synchronizing supply with demand and measuring performance globally. All this excellence reflects in our clientele list that boasts of renowned names. Our manufacturing brand is Natroof. Our exporting countries is South Africa and Dubai. Our company is blessed with an extremely valuable and visionary mentor Mr. Vinay Rohera. Owing to his consumerist approach and dedication, we have been able to establish ourselves in some of the most competitive markets of the world. We have been able cater a huge clientele across the global market. Our state-of-the-art infrastructural unit covers a wide area and enables us to manufacture optimum grade products within strict time lines with sufficient amenities. Our sound manufacturing plant is equipped with advanced technology based machines that help us in enabling bulk production in a streamlined manner. Along with this, we have a spacious warehouse for storage and arrangement of bulk products in a safe and secure way. We strongly believe that our workforce is our most valuable asset. Only due to their exceptional contribution, today we are able to satisfy our reputed clientele’s ever growing demands. They put in sincere efforts for the development flawless quality products. Moreover, our professionals always keep themselves updated with the prevailing market trends and upgrade the products’ features as per the changing trends. Due to our dedicated and well-coordinated workforce, we can fulfill the expectations of our global clients from manufacturing to timely shipment. Our Philosophy is all about what we commit is what you get. No false assurance, because we strongly feel our clients are very precious and they deserve the best deal. We will deliver what we say we can without the fuss ensuring your business objectives central to everything else. 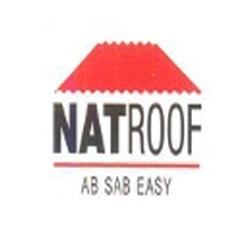 Natroof is our manufacturing brand.